There’s no problem getting around at Mystique Villas, because you get your own private golf cart. You also get a butler, housekeeping, laundry service, 3 pools, a kids’ game room, and signing privileges at Cap Juluca. The interiors are glamorous and the exterior is lush, this is the picture-perfect Caribbean villa. Mystique Villa is a 21,000 square foot home with six suites, three pools, and a full gym. This vacation rental is near Cove Bay and Maundays Bay. 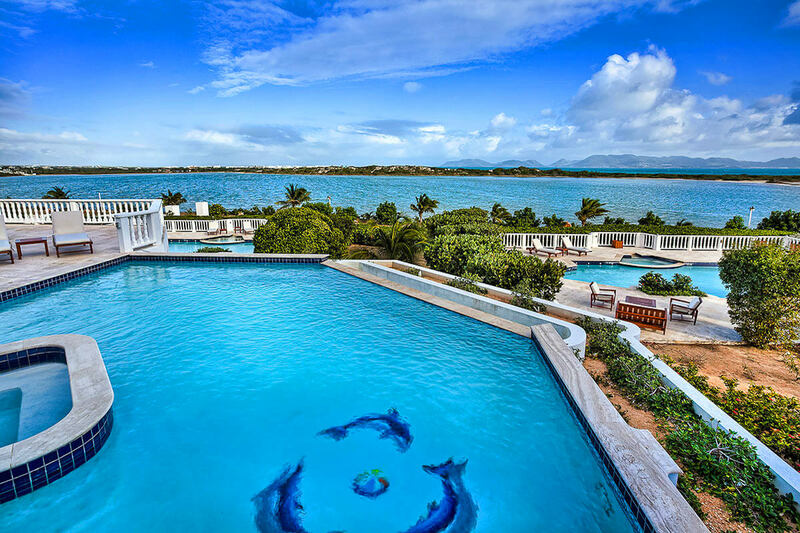 Mystique’s three pools all face Cove Pond, the ocean, and St. Martin’s distant mountains. Each pool has a hot tub and loungers around it, and they’re separated by hedges and palms between two levels. The stone terraces wind between manicured gardens, and the villa’s two wings jut out at a wide angle. Guests also have a personal, road-licensed golf cart. Mystique guests have access to a Main House with a reception desk and conference suite, as well as complimentary shuttle service to Maundays Bay Beach and Cap Juluca. The interior is fully air-conditioned and has WiFi. Folding glass doors lead from the upper level pool into the main living area, which is sunken a few steps below the dining room and kitchen. The kitchen has stainless steel appliances and granite countertops behind a large breakfast bar, and the dining room seats 8. There’s also an workspace on the opposite side of the kitchen with a Mac desktop, printer, and landline phone. The game room is on the upper level and features a colorful kids area, a ping pong table, computers, and more. This room opens to the rooftop dining terrace. All six bedrooms have a TV and an ensuite bathroom with a shower and tub. The rooftop suite has a king bed and a walk-in closet. The loft has a king bed, a walk-in closet, and access to the balcony. The upper level suite has a king bed and walk-in closet, and the both ground level suites have king beds, walk-in closets, and kitchenettes. There is also a separate junior garden suite that has a queen bed, a mini fridge, and exterior access only. Mystique is maintained by a laundress, three housekeepers, a butler, security, a concierge, and a chef (during holiday bookings). The beach is a 2-minute golf cart ride away, and the grocery store, restaurants, and health care are less than five minutes away. Take an 8-minute drive to the ferry or a 15-minute drive to town and the airport. Small pets are allowed for an additional fee. Guests are met at the airport or ferry dock by Sheriva staff and placed in a taxi to Mystique (guest expense). Your rental car can be delivered to the villa. Welcome rum/fruit punch and canapés, one private golf cart for “beach-hopping”, complimentary beach chairs and umbrellas at Maundays Bay beach, signing privileges at Cap Juluca's signature restaurants, boutiques, and access to watersports and use of all villa facilities including office niche with computer and printer, WiFi, multiple pools with expansive terraces. Daily resort fee of $20 per adult /$15 per child under 12 which includes daily Continental breakfast and bottled water replenished daily for the duration of guest stay. Car rental, private chef, grocery and beverage shopping (pre-arrival and during your stay), liquor and wine delivery, nanny service, baby equipment, spa services, yoga and personal training, photography, and private airport transfer/car service can be arranged for an additional fee.